Turn any surface into a base for LEGO and other building blocks. 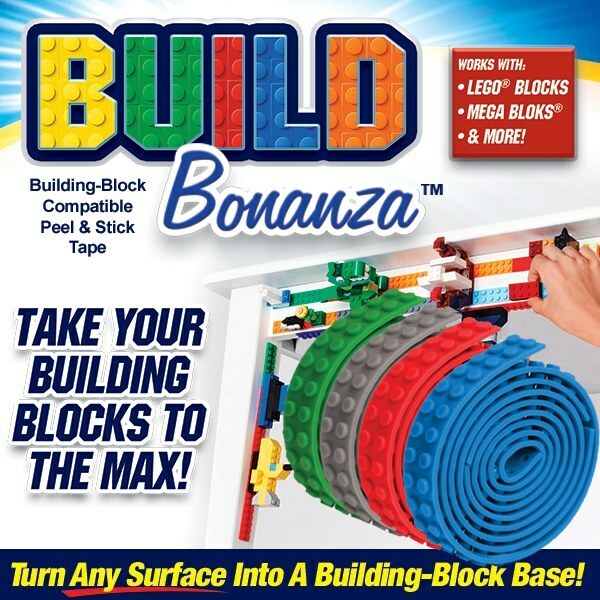 Unleash your creativity with Build Bonanza, the building block strips that allow you to build on any surface and even allow you to build upside down. Just peel and stick to any surface and connect your blocks. Build on flat surfaces, curved surfaces, up the wall, around the corner. Build Bonanza is easy, fun and reusable. You can even cut it for custom designs. Build Bonanza&apos;s universal peg system works with Lego blocks, MEGA BLOKS, KRE-O and more. The dual layer construction consists of a flexible studded top layer combined with a sticky adhesive bottom that will stick to anything again and again. Won&apos;t scuff furniture or leave sticky residue. Compatible with most toy building blocks. Set of four 3 ft. tapes.